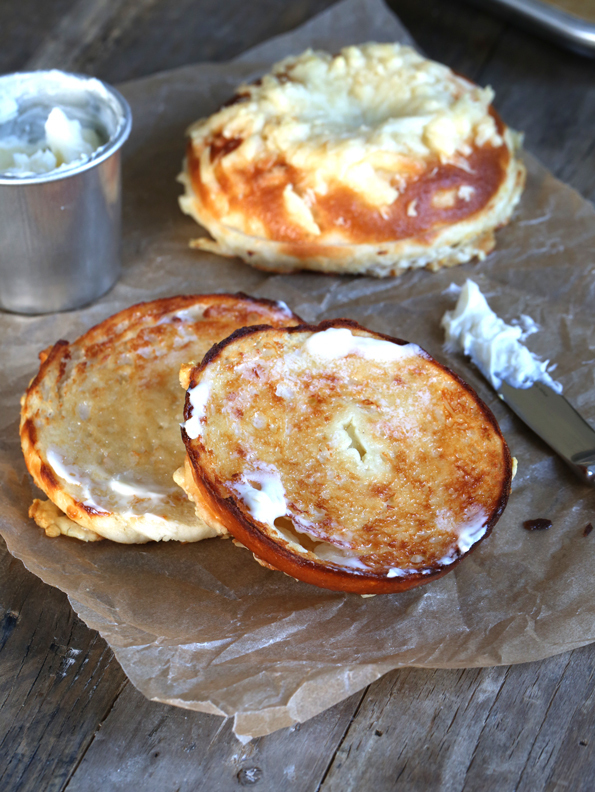 Super Fluffy Gluten Free Bagels | Great gluten free recipes for every occasion. These are not chewy on the inside, crispy on the outside New York bagels. It’s not like I really take that much pride in being from New York. It’s just that … it’s what I know. You know? And even though contrary to popular belief we don’t really have a ton of great pizza in New York (well, we do in my house, but youknowwhatImean), we do have great bagels. Even just a couple hours away in other cities in the northeast, like Philly, they just don’t know how to make a bagel. Mostly, they make rolls with holes. but a roll with a hole does not a bagel make. The first rule of bagel-making (gluten free bagels or not) is that you gotta boil the bagel. If it isn’t boiled first, it’s just not a bagel. Full stop. Boiling bagels before baking them is what makes for a thick and chewy crust during baking. It creates something of a moisture-barrier, and keeps the bagels from rising too much in the oven. That’s part of how they are slightly dense on the inside. But the shorter the boiling time, the thinner the crust and the more they will rise in the oven (so-called “oven spring,” discussed more fully in Gluten Free on a Shoestring Bakes Bread). The bagel recipes in Bakes Bread are for making true New York Bagels. They’re chewy and slightly dense, with a nice thick crust. Bagels. Slice them, toast them, smear them, *sigh* eat them. But it has come to my attention … that not everyone wants a Real New York Bagel. 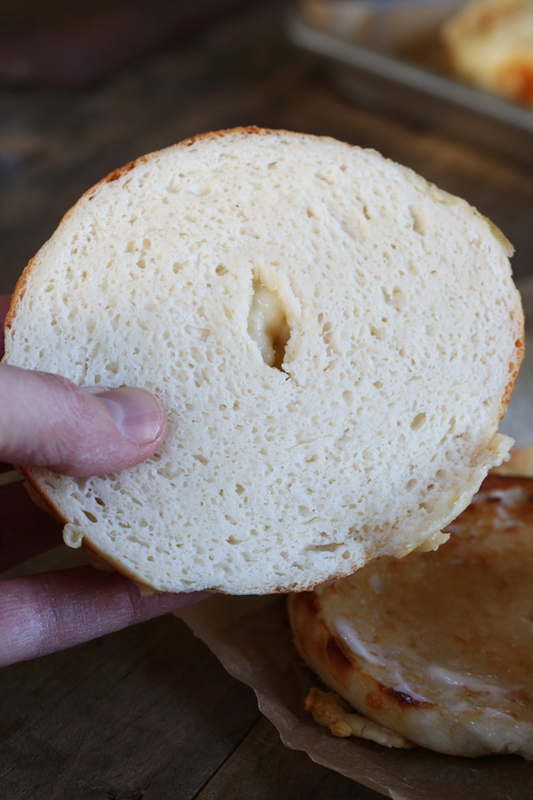 Some of you would really prefer what you get in, say, Starbucks: a light and fluffy bagel, with a crust, sure, but a thin one. And the inside? Fluffy as could be. And since I’m at your service, and this is not AllAboutMe, I present to you Super Fluffy Asiago Gluten Free Bagels, just like at Starbucks. These bagels have more moisture, and the dough is even slightly enriched (true bagels are lean lean lean) with a bit of butter and cheese. Plus, they’re boiled more quickly. Look at how fluffy they are inside! You don’t even allow the dough to proof overnight in the refrigerator. How’s that for speedy?! For me, even though I work from home, it’s still much, much easier to make gluten free bread dough ahead of time and allow it to proof slowly in the refrigerator for a couple days before baking it. That way, I get that nice, tangy yeast development (remember Bread FAQ#12! ), and I don’t have to wait around for that first rise. It happens while I’m living the rest of my life. But many of you want more bread doughs that you can make and bake in the very same day. Can you make the bagels without the cheese? You sure can! Just leave it out of the dough, and don’t sprinkle it on top. 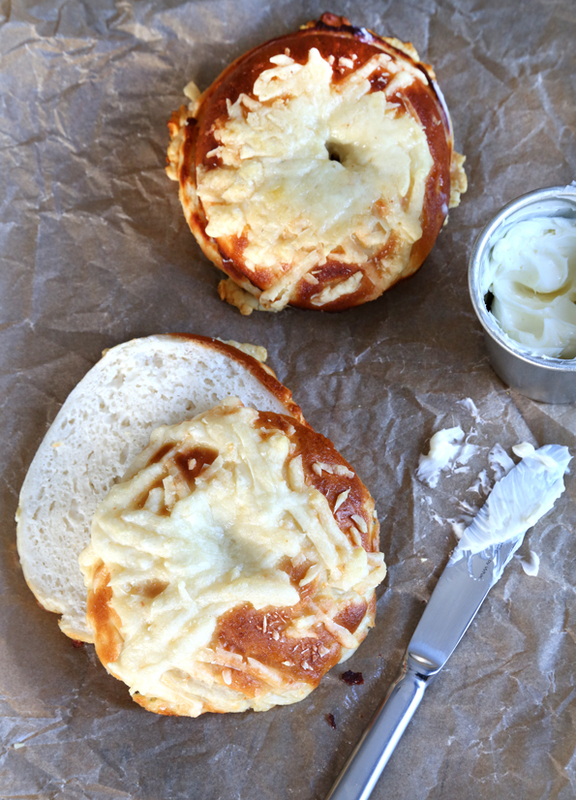 ;) One way or another, though, you neeeeeeed to have a REAL gluten free bagel. Those ones they sell in packages in the grocery store? C’mon. They’re rolls with holes. **For the all-purpose gluten-free flour in Gluten-Free Bread Flour, you can use either the High-Quality All-Purpose Gluten-Free Flour (below) or the Make-It-Simpler All-Purpose Gluten-Free Flour (below that). For this recipe, the High-Quality All-Purpose Gluten-Free Flour is best. It is a copycat recipe for Better Batter gluten free flour, so the commercially available Better Batter all-purpose gluten-free flour blend will also work well. For a calculator to do the math for you, click here. To make the starter, place all the starter ingredients in a medium-size bowl, and whisk until well combined. The mixture will be thick and shapeless. Cover and set the bowl aside in a warm, draft-free location to rise until doubled (about 40 minutes). Once the starter has finished rising, make the dough. Place the flour and yeast in the bowl of your stand mixer, and use a handheld whisk to combine well. add the salt, and whisk to combine. Add the risen starter, butter, and Parmigiano-Reggiano cheese to the bowl, and mix on low speed with the dough hook until combined. Raise the mixer speed to medium and knead for about 5 minutes. It will be sticky dough, but will become stretchier and appear thinner as the mixer kneads it. Spray a silicone spatula lightly with cooking oil spray, and scrape down the sides of the bowl. Transfer the dough to a lightly oiled bowl or proofing bucket large enough for the dough to rise to double its size, and cover with an oiled piece of plastic wrap (or the oiled top to your proofing bucket). Place the dough in a warm, draft free location to rise until nearly doubled in size (about 1 1/2 hours). To make the dough easier to handle, after it has finished rising, place the sealed dough in the refrigerator to chill for 30 minutes before handling. Once the dough has finished its first rise, line a large, rimmed baking sheet with unbleached parchment paper, grease it lightly with cooking oil and set it aside. Turn the dough onto a lightly floured surface. Knead until smooth as described in These General Shaping Tips. If you have never shaped this new gluten free bread dough before, please read those instructions carefully in the recipe instructions and watch the shaping videos in the link provided. Divide the dough into six parts. To shape each piece of dough, follow the directions for Shaping Small Round Rolls in this recipe, and then poke a hole with a well-floured finger vertically into the center of the round dough. Move your finger in a circular motion to widen the hole so that it does not close during proofing. For more directions and step-by-step photos on shaping bagels in the more traditional way, see pages 38-39 of Bakes Bread. Place each piece of bagel-shaped dough on the prepared baking sheet about 2 inches apart, cover with oiled plastic wrap, and set in a warm, draft-free location to rise until nearly doubled in size (about 45 minutes to 1 hour, depending upon the environment). About 25 minutes before the dough has finished rising, preheat your oven to 375°F. As the dough nears the end of its rise, make the molasses bath by dissolving 1 tablespoon of molasses and 1 teaspoon of kosher salt in 6 cups of water (approximate measurements are fine here). Bring the mixture to a boil over medium-high to high heat. Once the dough has finished rising, place the shaped bagels a few at a time into the boiling bath for only 30 seconds per side. Remove the bagels with a strainer and return them to the baking sheet. 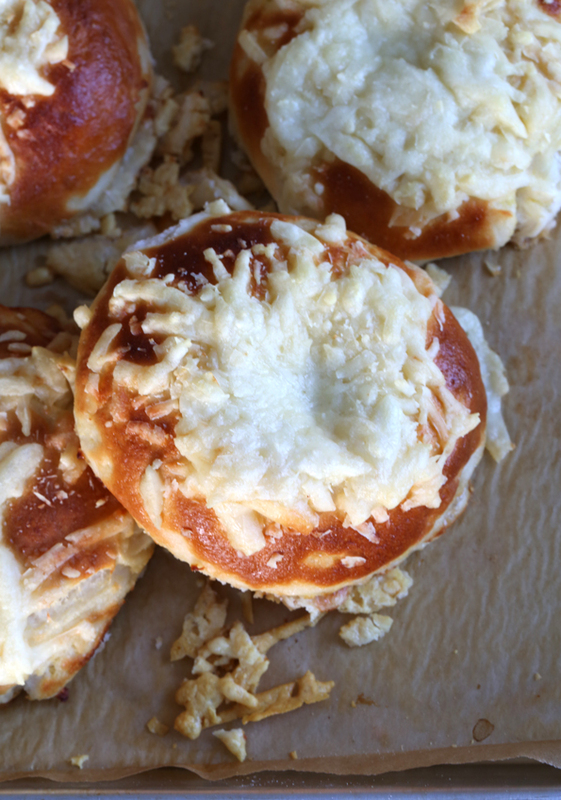 Brush the boiled bagels with the egg wash, and sprinkle generously with about 3/4 of the grated Asiago cheese. Repeat with the remaining bagel dough. Place the baking sheet in the center of the preheated oven and bake for 15 minutes. 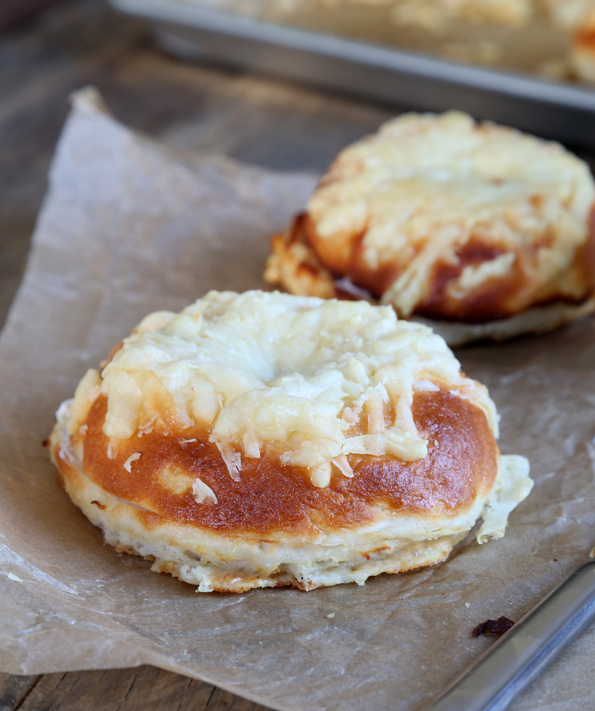 Remove the bagels from the oven and quickly sprinkle the remaining Asiago cheese over the nearly-baked bagels. 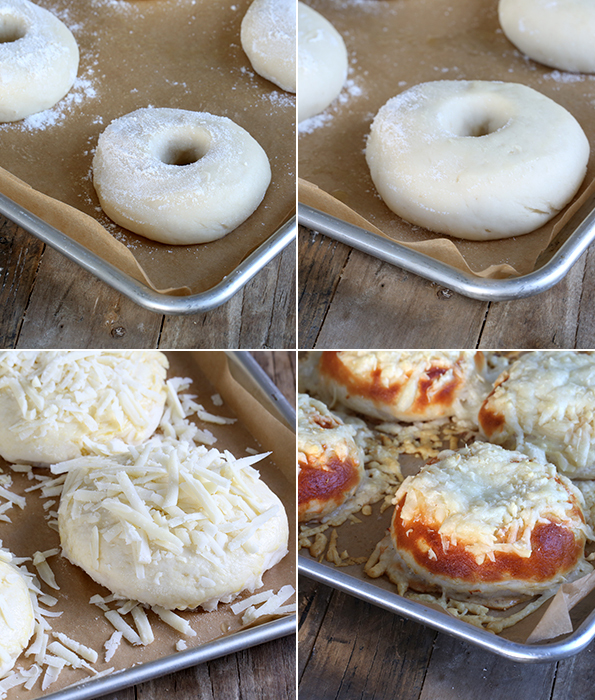 Rotate the baking sheet, return the bagels to the oven and continue to bake until they are golden brown all over and the cheese is melted (about 5 minutes more). To brown the cheese a bit, place it under your oven’s broiler for about 1 minute. Allow to cool on the pan briefly before serving. Adapted from the Plain (or Seeded) Bagels on page 123 of Gluten-Free on a Shoestring Bakes Bread: Biscuits, Bagels, Buns, and More by Nicole Hunn. Excerpted by arrangement with Da Capo Lifelong, a member of the Perseus Books Group. Copyright © 2013. For troubleshooting, please read these 21 Gluten Free Bread FAQs. I bet I have provided answers to your questions already, including information on how to sub out Expandex for Ultratex 3. P.S. Wondering how to make more traditional, chewy New York bagels? Get your copy of Gluten Free on a Shoestring Bakes Bread, and turn to page 123! If you liked this recipe, you'll love this book! If you’re eating gluten-free, you know the challenges of bread. Gluten-Free on a Shoestring Bakes Bread tells you everything you need to know to make the artisan-style bread you’ve been missing—and at a fraction of the cost. Hi Nicole, I checked at our health food store and they were unable to help me with unflavored whey protein isolate. Is this the same as powdered milk? If not, is there a substitute? Very new to this, sorry for the ignorance! Hi Nicole, I’m super excitecd to try this! Can this dough rise in the fridge for 12 hrs just like the other bagles? I’m sorry you’re having trouble finding Expandex in Australia, lewcianci, but I’m afraid that I have no way of knowing what is and is not available in other countries with any level of confidence, and I’m afraid that I have to use everything in my disposal, within reason, when developing recipes—particularly for my cookbooks. I have worked very, very hard to make sure that non-U.S. readers know how to use Ultratex 3 (which is another type of modified tapioca starch) in my recipes in place of Expandex (scroll down to #6 in that link). I believe that others in Australia have been able to find Ultratex 3. Perhaps you can find that. Can I sub anything for the potato flour in the high quality mix? I like using the pectin since it seems to add a nice consistency to the finished product. I’m afraid not, Cathy. Pectin is already in the blend, and it is not a substitute for potato flour. Ok I will just do the simple version then. That is what I have been using from your book and it has worked well in the bread flour blend. I love the better than cup for cup blend too. It makes great scones. I’ve been wanting to make blueberry bagels so bad, and found this recipe. Do you have any advice for adding blueberries? Should I use a little less water maybe? Can’t wait to try making these! You’ll really have to experiment, JoJo, as blueberries have a lot of moisture. I actually think you’d do better using the bagel recipe in Bakes Bread, rather than this one. Thanks! I’ll check that out, and maybe do some experimenting tonight! Getting ready to make these … I have your Bread book and was wondering if you can double dough recipes? I know in the past it was not suggested but I was wondering with this new method, if it now works? You sure can, Tracey! Double away! Who needs Panera Bread! These are amazing! My husband thought he would never have another real (N.Y.) bagel again when he was diagnosed with celiac 5 yrs ago- thanks Nicole you have brought a big smile to his face! I love GFOS BAKES BREAD! These look so good. We made your NY bagels a few weeks ago, and they were absolutely delicious! My only problem is that they were slightly ugly – I seemed to destroy their beauty when I put them in the water bath to boil. And the same thing happened when we made soft pretzels (from the Pretzel Roll dough) this weekend. Do you have any special tricks for getting them boiled and still keeping their shape? I thought that I perhaps over-rose the bagels, but I was careful not to do that with the pretzels and still had the same problem. I guess I’m just saying that I’m a klutz and I took your beautiful dough and made it ugly! You may have measured your water too heavily, Linda. Try measuring water by weight, not by volume. See the answer to FAQ#21 for details. That would make the dough more fragile. Other than that, I’d say just be careful not to overproof and handle them gently! You can even try removing the plastic wrap for the last 15 minutes of rising so they begin to dry out a weeeeee bit before boiling. No problem! :) It is the least I can do. You have the hard job around here!! My husband’s office is actually right around the corner from Mozzarelli’s, and we have eaten their takeout many times. I’m afraid I really don’t care for the pizza at all (it just tastes like potatoes to me), but I’m still happy that it’s there so my son has something to eat. Since we are from NY/NJ area, I am not sure my family would want a bagel like in Starbucks. I do not believe we ever had a bagel from Starbucks. We are real deal people. We are actually food snobs. And, yes, the bagel recipe in the book is real deal GF NY style bagels! My family does not mind the wait for the slow rise in refrigerator because they truly appreciate the outcome! Because everything I have made from Nicole’s recipes is awesome, they no longer question — they just eat and enjoy! All I have to do is say, “This is Nicole’s recipe” and my family knows whatever it is will be great! Thanks for the recipes, really like them. Please provide a substitute for Expandex or Ultrex . We can not get them in Canada. To import them from a seller in the US, the exchange rate, shipping/handling, and duty ends up being ridiculously expensive, so they are not an option. Please come up with a workable substitute. I was going to make these without the cheese but I am sad to see that I need both an ingredient I can’t eat (whey protein) and one that I don’t know how to get (expandex) because these look awesome. There is a link in that answer to the Resources page as well. Btw, Mozarelli’s on 23rd Street (www.mozzarellis.com/) has great GF pizza when you don’t want to make it yourself or if you’re in the hood. Nicole, I don’t think I tell you enough that I love you in a completely non-creepy way. You are a miracle worker! These look amazing! Oh my goodness, I didn’t realize the bagel recipe in your new book is for New York style bagels. We lived in Rochester, NY for 2 years when I was in elementary school, and the only thing I remember about living there is the bagel store with the killer bagels, and eating them with tons of whipped butter. I guess I am going to be making bagels soon! Thanks Nicole! Alexis, as far as I’m concerned New York Bagels are the only real bagels at all! Oddly enough, years and years ago I went to a friend’s wedding in Rochester and had bagels, and they weren’t half bad! Alexia, the bagels in the book are to die for! My gluten eating family is requesting their favorites. I will have to get a batch proofing tonight! Dairy be darned. I am going to have to eat one of these. That’s the trouble. I totally believe I can live without gluten, but dairy, oh dairy. Why don’t you love me back? they so are ‘rolls with holes’ and I hate them so much. Thank you for these recipes – you’ve changed the quality of our lives!!! love you! I bake and this recipe is still super confusing. Sara, I’m sorry you’re having trouble following the recipe. Baking yeast bread can be confusing at first, but if you read through the recipe thoroughly, take it step by step and trust the process, it can become really fun and rewarding. Also watch the videos on utube, they help a ton. Rolls with Holes….that gave me a good chuckle this morning…and I needed it. Thanks Nicole…They look great !